If you are visiting Citrus, Hernando or Pasco counties and are looking for a trail that offers something for everyone, look no further than the Withlacoochee State Trail. This 46 mile long paved trail is one of the longest paved rail trails in Florida and has been designated as part of the Florida Greenways and Trail System. This means you will be able to take in incredible scenery as well as view unique plants and wildlife on much of the trail. There are 10 trailheads along the Withlacoochee State Trail. The Gulf Junction Trailhead is the northern gateway to the trail. Located in Citrus Springs, it has plenty of parking and is an ideal starting point for daytrippers and those who want to cycle, skate or hike the entire trail. Inverness is near the middle of the trail and is also a popular starting point. All of the trailheads have restrooms available, most have parking, and some offer tent and RV camping near the trail. Most of the trailheads are within a few miles of one another and there is plenty of signage to let you know how far you have progressed along the trail. 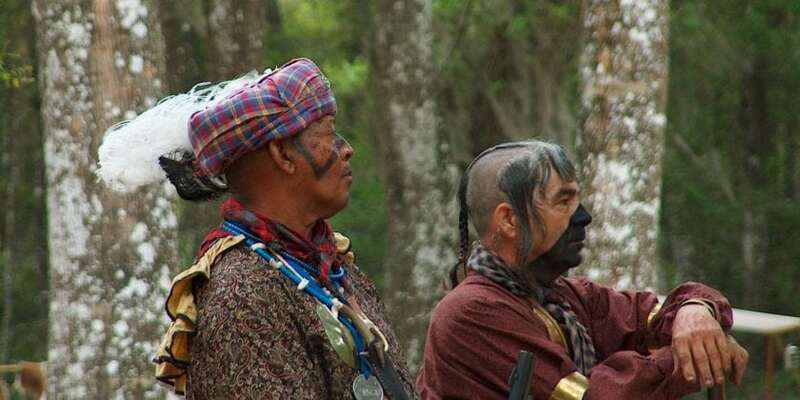 While there is a strong connection to Florida history along the Withlacoochee trail, you will find no shortage of modern amenities designed to add to the experience you will have while enjoying the beautiful scenery and recreation. A 46 mile long, mostly flat, paved trail is a magnet for cyclists of all skill levels. Several bicycle shops along the route service those who need some quick maintenance or may have forgotten to pack a helmet. On the first Sunday in October, the annual Rails to Trails Bike ride takes place. Proceeds from the ride go towards maintaining the trail and those riders who complete 100 miles or 100 kilometers receive medals and certificates marking their accomplishment. Sure, you are hiking or biking the Withlacoochee Trail and want to feel as if all those outdoor activities are making you healthier, but why not stop for a cinnamon stick or some ice cream? Or maybe even some great pub food. Seafood, pizza, country cooking, they are all available near the trail. Most places are reasonably priced and are very accommodating to visitors who are passing through. The Withlacoochee Trail runs an along what was once the Atlantic Coast Railway Line. This line at one time extended from South Florida to Richmond, Virginia. The portion of the line that the Withlacoochee Trail is on was part of the rail line that connected Dunnellon with Naples. After the line was shut down by CSX in the 1980’s the State of Florida purchased the rail as a part of their “rails to trails” program. Much of the area history is just off this path. The Old Courthouse Heritage Museum, in Inverness has permanent exhibits showcasing much of the history of the region. There are also traveling exhibits that highlight the rich history of Florida. One destination that is accessible from the trail is Fort Cooper. The site of the state park was once used by the U.S. Army and was the scene of several battles in 1836, between the First Georgia Battalion Volunteers and the Seminoles which are re-enacted for visitors. Now it is a wonderful recreation area that offers all the amenities you would expect from a state park, including tent camping. 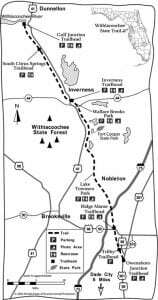 There are several options for lodging along the Withlacoochee Trail. RV owners, tent campers have many options from which to choose. The Florida State parks brochure has a list of options right on the trail and can be downloaded here. The Withlacoochee Trail has something for everyone who enjoys the outdoors. Natural beauty, a well maintained trail, and nearby communities that are very friendly to visitors coming to take in all that the trail has to offer. The trail is open from 8:00 AM to sundown, year round and is free of charge. For more information on the trail, call 352.726.0315 or visit the Withlacoochee page on the floridastateparks.org site.